Playscape Creations is an award winning design and construct company for innovative play environments with a special focus and expertise in designing and building play environments for all. Most recently we created a Da Vinci inspired intergenerational play environment, collaborating with JW Concepts, HNK and Gladstone Regional Council. 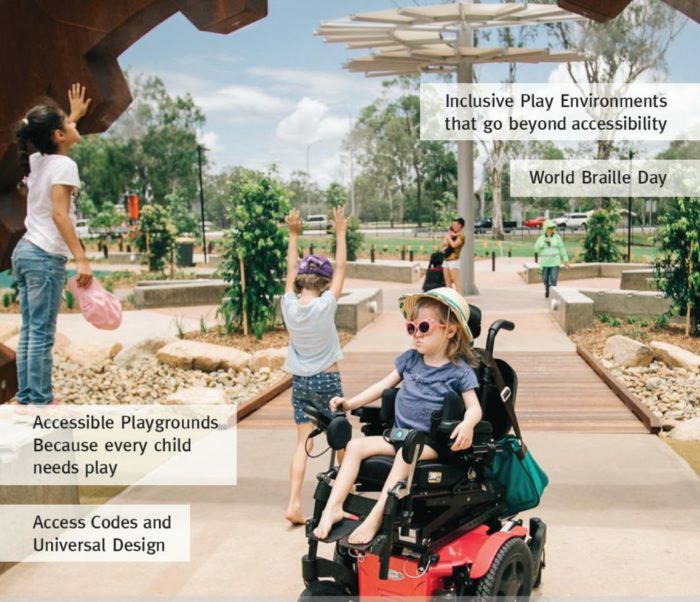 Attending an Inclusive Playspace Design presentation I conducted at the Parks and Leisure Annual Conference in 2015, Gladstone Regional Council’s Parks and Environment Manager was inspired to hear our take on the importance and value of integrating a sensory design methodology in playspace design to achieve a truly inclusive outcome – beyond accessibility. Gladstone has a strong Industrial history, so when Council engaged us to design this park we drew on the pioneer of technology, Leonardo da Vinci, and then added natural inspirations to provide this “Industry meets Nature” design. The overall form is based on cogs’ interaction with each other and providing islands of play and recreation. Every aspect of this park is unique with special elements that engage and inspire – a custom climbing tower and ‘Climbmax’ challenge net climber form the centerpiece of action where children can test their limits and dare their abilities. However not everyone wants to climb, and a truly intergenerational design provides choices for everyone to enjoy the environment. The overall design incorporates sensory features accommodating children and adults with disabilities including sensory processing disorder, auditory processing disorder, visual impairment, down-syndrome, autism, cerebral palsy, muscular dystrophy and spina bifida. It is important for ALL to have variety of sensory experiences for healthy development. These include experiences that involve movement (vestibular system), climbing (proprioceptive system) and a mix of tactile, visual and auditory experiences. The overall design includes the planting of trees to create natural shade over the play area, and physical shade in the form of the ‘Da Vinci Flying Machine’ that is both a striking visual attraction by day and a sensory light feature by night. More shade will be added by March 2018 as shade is important for all who visit and play so that they do not experience sun or heat exposure while at the park. For some children with disabilities this shade will make the difference between their being able to play or not play. Their medical condition or medications may limit how long they can be in direct sunlight or high heat. Shelters are also located throughout the park to provide a shaded place to rest and enjoy a snack during the family play experience. This design includes a mix of play surface that supports the type of play experience found in that area. Some children using mobility devices might have limited access to some equipment but the wide pathways and use of rubber and concrete allow them to meander through the entire play environment. Everyone will find a full variety of sensory play experiences at Lions Park giving each the “just right” challenges. The park includes different zones – here cogs of experiences; the Swing zone, the Cozy Dome zone, the Active zone, the wet zone and hang out zones. Each of these provides children with a different type of play experience that helps them build their physical, sensory and social skills while they play. The close proximity of each area enables a parent to keep track of several children playing in different areas at one time. The integrated art, light and misting features allow the entire community to enjoy wandering through the space as it delivers a truly intergenerational sensory experience. And at night the space becomes a sensory wonderland again, with motion activated lighting and misting allowing for increased use of this destination. The park was designed to be fun and educational, enabling children and adults to explore the 7 Senses – hearing, sight, smell, touch, taste, vestibular and proprioception, which is the sense of position and strength of movement of the limbs. The project was ultimately delivered by JM Kelly Constructions, the Principal Contractors for civil and construction work on site, with our team working closely with their program to provide the Artistic Playground and Sensory items, and helping ensure a seamless delivery of this amazing space. Overall, this park has many opportunities for play for all regardless of their medical diagnosis, age, cultural background and gender. Everyone will find their “just right” fit as it is designed to support their physical, sensory and cognitive needs while also providing them with a world of fun to acquire new skills in all these areas. The entire park provides the community with a great space to work on their socialization and self-esteem as they walk, run, roll, slide, climb, swing and spin together. It’s a place and space for the whole community. – you can see some action packed video and more photos, and read one of the local media stories here.